There are classes for beginners through to advanced decorators. We can also arrange private tuition if you have a specific skill you’d like to learn. 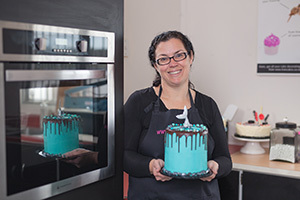 Private tuition can vary, from helping you to cover and decorate your cake to learning a particular skill such as making sugar flowers, piping cupcakes, modelling techniques and more. We have regular free demos in store showing you new ideas for creating your cakes. Occasionally there will be a charge for the demo. Learn techniques for gorgeous cakes.